As I have written earlier, there is significant immigration from Africa to the United States underway. The New York Times estimates that those born in Africa are about 4 percent of New York City’s immigrant population. Africans, like any other group, live all over the city. However, Andy Kiersz has published two fascinating maps on Business Insider that shows where in New York people speak specific foreign (not English) languages at home. Not surprisingly, Spanish is dominant in most neighborhoods in all five boroughs. There are Russian enclaves on Staten Island, Brooklyn, and Queens, large Chinese speaking areas in Brooklyn and Queens, French Creole in Brooklyn and a single French enclave on the east side of Manhattan. Otherwise, it is Spanish that is the most commonly spoken foreign language in New York City households. Kiersz then mapped those neighborhoods to show the most common non-English, non-Spanish languages, that is, the third most widely spoken language at home. That is where the Africans show up. On his map, Kiersz combines Kru (spoken in Liberia and the Ivory Coast) with Ibo (southeast Nigeria) and Yoruba (southwest Nigeria) on his map. Those speakers are to be found in north, central, and south Bronx (the neighborhoods include Woodlawn, Eastchester, Mott Haven, and Hunts Point). Amharic, spoken in Ethiopia, is the third largest language in the Rockaways section of Brooklyn. Mande languages are the third most widely spoken in east Bronx (including Throgs Neck).The Mande family of languages are spoken in Burkina Faso, Mali, Senegal, Gambia, Guinea, Guinea-Bissau, Sierra Leone, Liberia and the Ivory Coast. From Kiersz’s maps, New Yorkers born in Africa are mostly from West Africa, especially Nigeria, Ivory Coast, and Liberia. Amharic speakers are the only large group of African language speakers from outside West Africa. 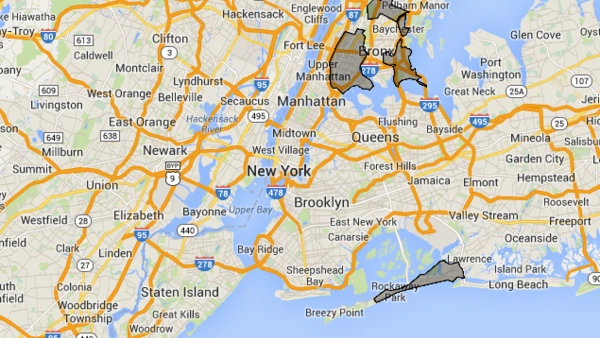 African-born New Yorkers mostly live in the Bronx, Queens, and Brooklyn. Few are to be found in Manhattan or Staten Island. New York City, with a population of 8,405,837 (2013 U.S. Census) is by far the largest city in the United States. It is growing at about 2 percent a year, with a surplus of births over deaths and of immigrants into the city. However, New York City is small in comparison with Lagos (estimated population of twenty-two million) or other cities in China and the developing world. Is the International Response to Ebola Enough?